Many Many years ago there was a demon called Hiranyaksha. He was a ferocious and a cruel demon. He believed that no one on this planet and no one from the heaven could ever kill him. The reason he believed this is because of a boon he was granted by Lord Brahma. He prayed to Lord Brahma for many years, he pleased the Lord with his prayers. Lord Brahma was touched by Hiranyaksha’s dedication and granted him a wish - a wish that Hiranyaksha thought would make him invincible. Hiranyaksha asked Lord Brahma to grant him a wish that no man or no God can ever kill him. And then he went on to add a list of beasts as well and asked Lord to grant him a wish that none of the beasts on his long list could ever kill him as well. Hiranyaksha was careful to include almost all beasts…But he forgot to include ‘boar’. Not sure if he forgot or just thought a boar could never kill him….But anyways he forgot to include ‘boar’. Once the wish was granted Hiranyaksha truly believed that he was invincible and went on to create havoc and serious atrocities around the planet. After every life cycle, Lord Brahma has a nap. During His nap, He always has the vedas next to Him. Hiranyaksha stole the vedas from Lord Brahma (during His nap). He then pushed ‘Mother Earth’ to the bottom of the ocean. When this happens, Lord Brahma approached Lord Vishnu and begs Him to intervene. 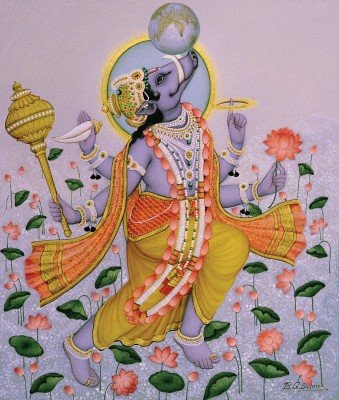 Lord Vishnu incarnates Himself as a boar. He then went deep down into the ocean and brought ‘Mother Earth’ to the top from deep down the ocean. He then killed Hiranyaksha and handed over the vedas to Lord Brahma. One might find it hard to believe how ‘Mother Earth’ could be pushed to the bottom of the ocean - The mythical story above could just be a symbolic representation of severe floods/melting of ice which caused the entire land to be covered in water. Evil never ever prevails - It is only a matter of time before evil will be conquered. Do not ever underestimate anything - Hiranyaksha underestimated the boar and finally was killed by a boar.